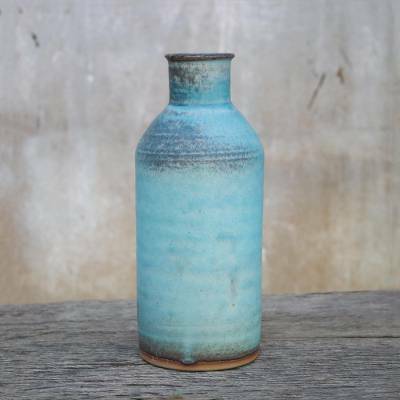 Handmade Blue and Brown Ceramic Vase, "Blue Memories"
Earthy and appealing, this bottle-shaped vase is crafted by Thai artisan Duangkamol. The artisan forms the vase from ceramic and gives it a beautiful blue glaze with umber accents. The simple but attractive vase looks at home in any setting. 27 cm H x 10.7 cm Diam. 10.75" H x 4.2" Diam. You can find ceramic vase 'Blue Memories' by Duangkamol in vases categories such as Ceramic Vases. Enjoy exploring these sections for other Novica treasures.